In this set of birth announcements from a hospital in Pennsylvania, I found myself more fascinated by all the middle names than anything. Count with me. I started to think about middle names and how often a more common or "filler" name is chosen. I wish there was an official SSA-style list for just middle names so we could calculate the most popular ones. However, it would make a difference if these were family names or used for sentimental reasons as opposed to just filling a space. Beyond just finding repeating middle names, so many of these are classic or traditional names. I do like seeing the more unique options like Patience and Raven, Axel and Dash. 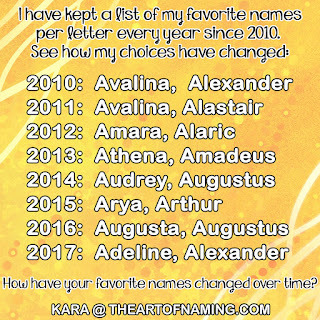 However, I used Alexander for my own son's middle name and Sophia for my daughter so I understand the thought process. What are your kids' middle names? What do you think of this list? Did any of these names stand out to you? Could you pick a favorite? Closing out Irish Week, I present to you a very Irish girl name. 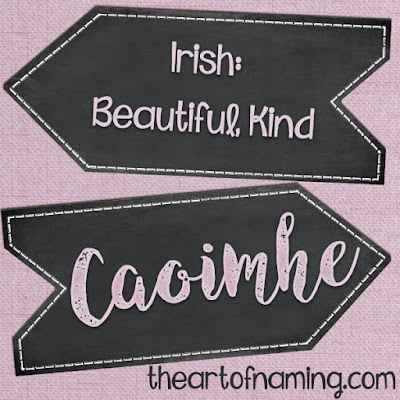 The name Caoimhe is pronounced KWEE-va and sometimes just KEE-va is accepted. It has been anglicized to produce the variants Keeva and Keavy. It comes from the Gaelic caomh which means "beautiful, gentle, kind". So while it may be difficult for the non-Irish to know how to pronounce, it definitely has a lovely meaning! It is also used in Scotland with the same spelling, meaning and pronunciations. According to the most recent stats on BehindTheName, Caoimhe ranks at #16 in Ireland and #35 in Northern Ireland. Nameberry confirms that this name has been consistently popular for quite a while, usually ranking in the Top 20 or so. In the US, Caoimhe is definitely hindered by pronunciation issues. It has only been given to girls since 1996 but it has never had more than 19 births in a single year. In 2013, there were 18 births for a ranking of #6734. Revision: As of 2016, the name only had 11 births. This indicates that it won't be common any time soon. Meanwhile, the anglicized spelling Keeva has been in use since 1968. It hasn't had regular usage though and it is by no means popular. Its biggest year was 2013 with 43 births for a ranking of #3580. It does a bit better than its Irish form but Keeva is still very rare. Even if you're not Irish, what do you think of this name? Did you know how to pronounce it before reading this? Have you ever known someone with this name? I stuck to using plenty of original Irish spellings, but it isn't necessary. Caoimhe could also pair with anglicized Irish names or those of an English origin. What would you pair with Caoimhe? Welcome to World-Wide Wednesday! 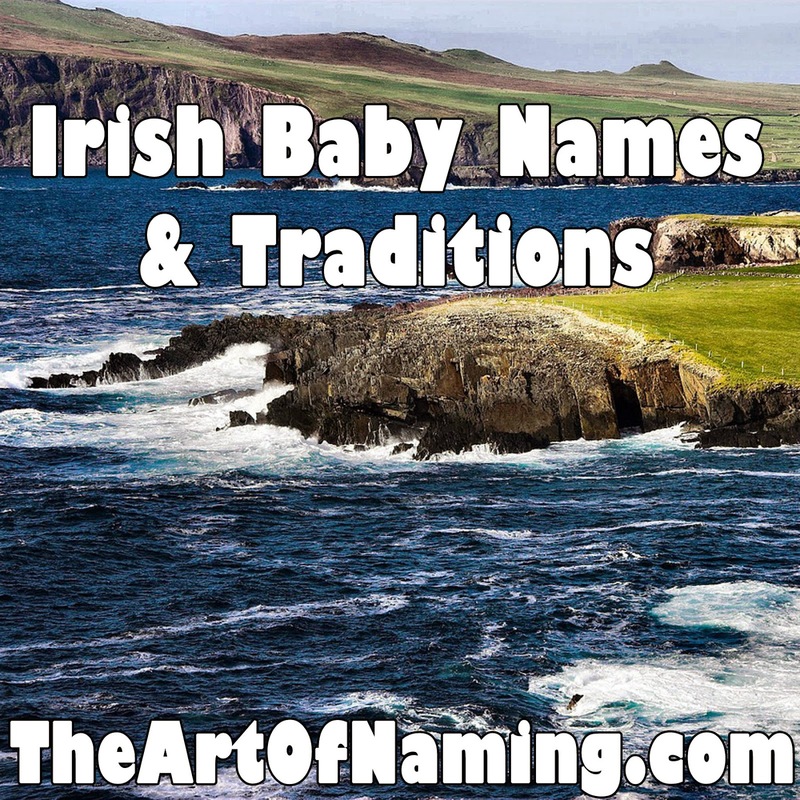 Today we'll take a look at Irish baby names and naming traditions! Another fun tradition that is still carried out in recent years involves a "magic" handkerchief. On their wedding day, Irish brides are given a special white handkerchief to carry. When their first baby comes along, that handkerchief is turned into the baby's bonnet for their Christening. The father's have traditions too. One called "Wetting the Baby's Head" is essentially a toast for the newborn's health and happiness. Traditionally, whiskey is used to commemorate the moment and is usually enjoyed by the father and his friends. Other traditions may include placing a silver coin in the baby's hand during his Christening to ensure a prosperous life; and tying a red ribbon to the baby's cradle until their first birthday to keep away mischievous, baby-napping fairies. Of course, there's always plenty of Irish proverbs and blessings associated with pregnancy, childbirth and all the milestones a child will reach. 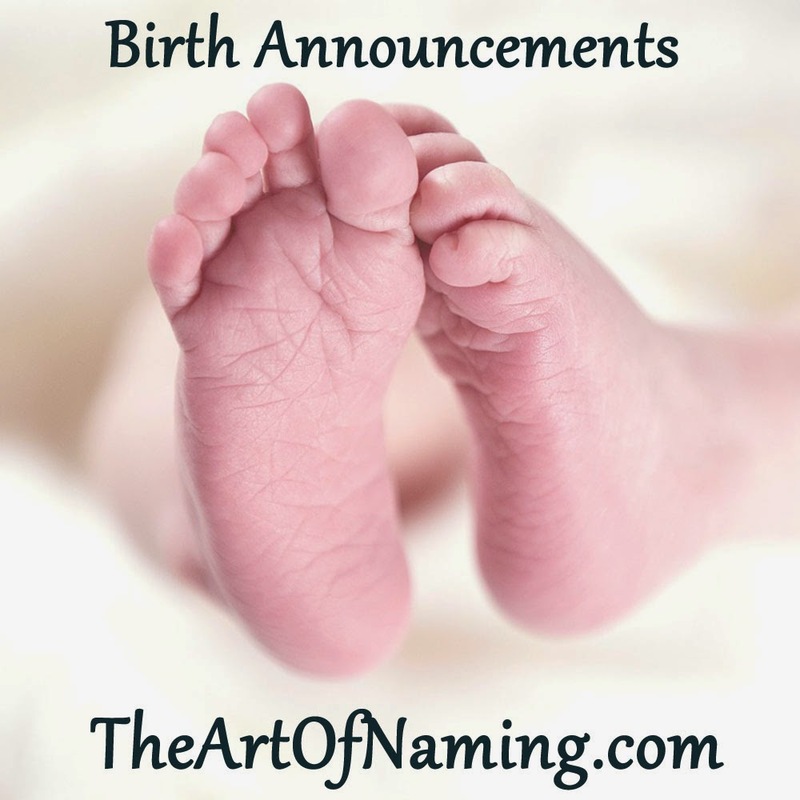 As far as actual baby names are concerned, a formal Irish personal name will consist of a given name and a surname. Irish surnames are rather patronymic and include O' meaning "grandson of" or Mac meaning "son of". A boy will usually have the same surname as his father. A girl's surname will replace the O' with Ni which indicates "daughter of the grandson of" or Nic which means "daughter of the son of". A son of a man named Ó Dónaill would keep that surname, a daughter would be known as Ní Dhónaill. However, when it is anglicized, she would revert to the same name as her father and brother: Ó Dónaill. There are other rules pertaining to a surname that begins with a vowel too; and sometimes the Normanic prefix Fitz will be used. When a woman marries, she can opt to take her husband's surname but instead of keeping his O', she would replace it with Bean Uí which indicates "wife of the grandson of". Instead of Mac, she'd use Bean Mhic or "wife of the son of". Bean may be omitted in certain cases allowing her to simply use Uí or Mhic. A woman marrying a man named Ó Dónaill may choose to be use Bean Uí Dhónaill or Uí Dhónaill as her surname. In the case of first names, sometimes an adjective will be added to distinguish, for example, a son from his father like the English junior and senior. Mór ("big") and Óg ("young") are typically used in this case but instead of being placed at the end of a name, they'll be inserted between the given name and surname. So Seán Óg Ó Súilleabháin would be anglicized to "John O'Sullivan Jr." Sometimes the O' is dropped when it's been anglicized. Other adjectives that could be applied to a person may simply indicate their hair color, but these are always informal like a nickname: Pádraig Rua ("red-haired Patrick"), Máire Bhán ("fair-haired Mary"). One more interesting possibility that I'll mention involves traditional Gaeltacht names in Irish-speaking areas. They still customarily give a child a given name followed by his father's name and sometimes followed again by the paternal grandfather's name. For example: Seán Ó Cathasaigh (Sean O'Casey), son of Pól, son of Séamus, would be known as Seán Phóil Shéamuis. Sometimes a mother's name or a maternal grandfather's name could be substituted in there if they are well-known in the area. These types of names are not official but used more for distinguishing people who share a name and are living in the same area. While most Irish people have a traditional Irish spelling for their name, many also opt to anglicize it, especially if they are somewhat famous. A fun example is that of former US President John Fitzgerald Kennedy. If he ever used it, his Irish name would be Seán Mac Gearailt Ó Cinnéide. He was born in the US but all four of his grandparents were the children of immigrants from Ireland. Today, it isn't very clear how many people still strictly follow the familial naming patterns. The top names used on Irish babies in recent years seem to indicate that more parents prefer choosing a name that they love instead of adhering to traditions. Notice how many of the Top names were given to babies in 1963 compared to the number of births for each Top name in 2013. This indicates an increase in the pool of names being used in general. I imagine there has been a lot of influence from England and the US. To view the entire Top 100 names, visit this page and view the tables at the very bottom. What do you think of Irish traditions of the past? 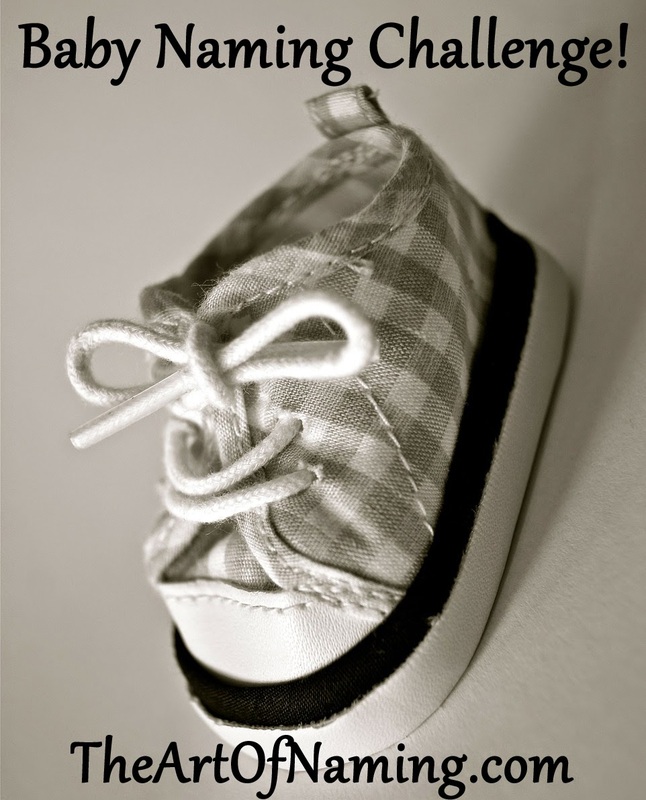 Are you familiar with more modern traditions in baby naming? If so, please share your insight in the comment section! Which of the above names is your favorite? [Note:] My paternal ancestors come from Ireland but I have never been there. I have, however, learned quite a bit of the language. If any of this information seems incorrect, please let me know! Today is the start of Irish week! We'll explore Irish baby naming traditions on my World-Wide Wednesday segment and learn more about an Irish girl name on Friday. Right now, let's investigate one of my favorite Irish boy names: Cillian. 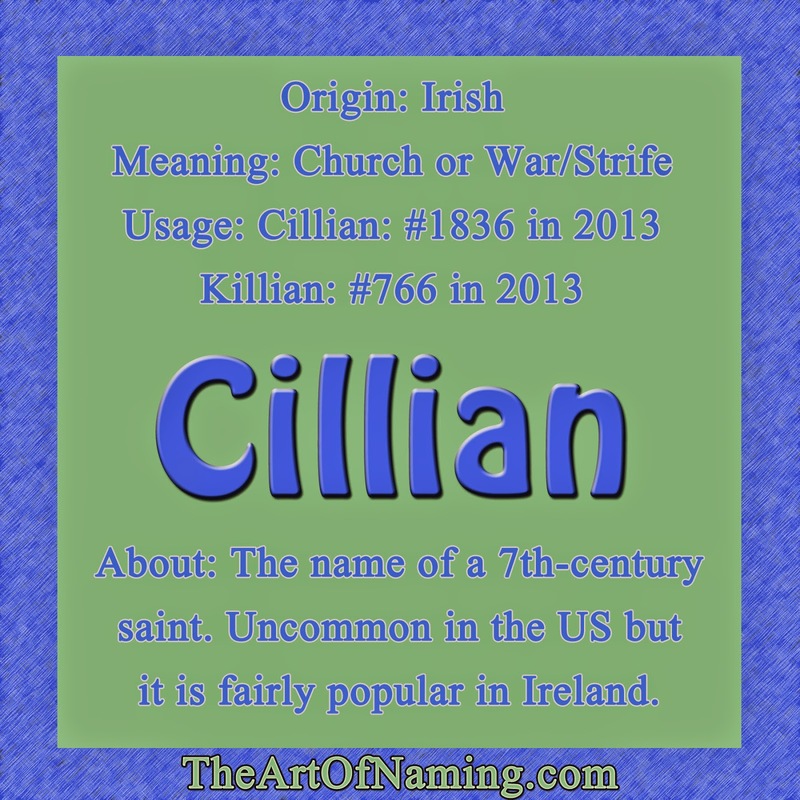 Cillian is pronounced KILL-ee-an which is made more evident with the alternate spelling Killian. Both names are said to come from the Gaelic ceall meaning "church". Other sources suggest that its meaning has something to do with war or a warrior and strife based on the Irish ceallach instead. The name Kelly also comes from the ceallach family tree. Despite sometimes being considered a softer name in Ireland, Americans tend to view Cillian as a tougher name with its meaning and that harsh first syllable. As far as associations go, there was an Irish saint who was known as Cillian in the 7th-century. A modern namesake is that of actor Cillian Murphy today. There is also the association with the brand of beer known as George Killian's Irish Red. And on television, Captain Hook is also known as Killian Jones on Once Upon A Time. Cillian is doing rather well in popularity on native soil, ranking at #23 in Ireland and #60 in Northern Ireland according to the most recent data on Behind the Name. However, in the US, Cillian isn't faring as well as the more obviously pronounced Killian. In 2013, there were 77 boys named Cillian in the US for a ranking of #1836. Killian has been in the Top 1000 since 2007. In 2013, there were 292 boys given the name for a rank of #766. Cillian has only been in use in the US since 1995; males named Killian have been around since 1982 and females since 1986. Nicknames could include Killy, Lian or Ian. What would you pair with Cillian? Our celestial girl name of the week is the underrated Portia. This is the name of one of the moons of Uranus which was named after a Shakespearean character. The play "The Merchant of Venice" was written by William Shakespeare in 1596 and it involved a woman named Portia who disguised herself as a man so she could defend a man named Antonio in court. There was also another Portia in Shakespeare's Julius Caesar who was based on a historical character, the wife of Brutus. The name Portia is a variant of Porcia which comes from the Roman family name Porcius. I was a little surprised when I realized the meaning of the name, although it makes total sense based on the root of it. It has always been a somewhat classy and sophisticated name to me. 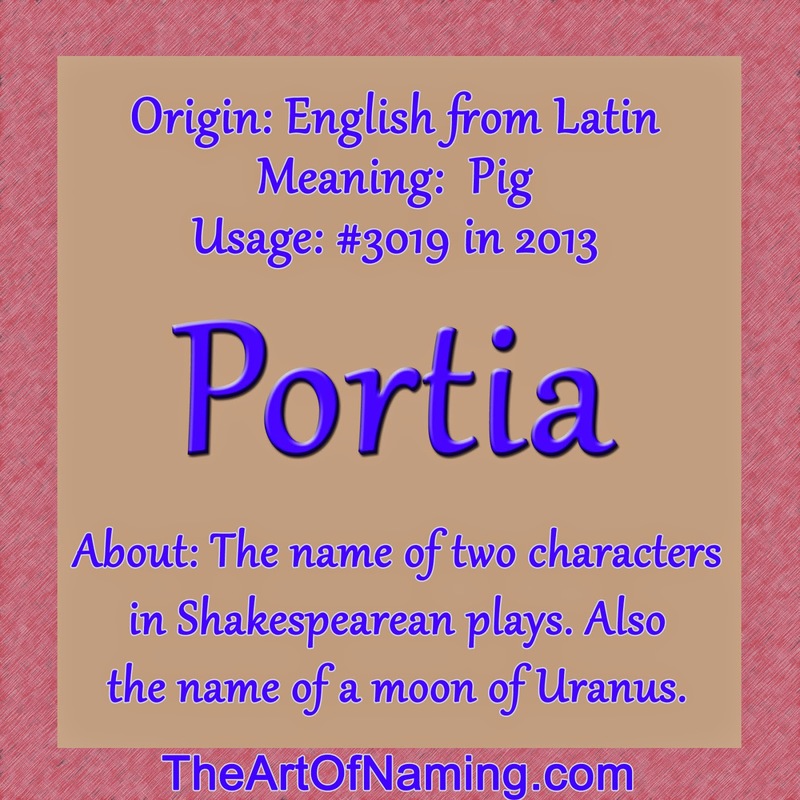 As a member of the Porcius family, Portia does indeed mean "pig" from the Latin porcus. Can you see it now? If you know any other Latin-based languages, it's probably pretty obvious to you. Nevertheless, Portia is a lovely name despite its meaning, but it has never found solid ground to stand on in the baby naming world. Portia has been used in the US since 1882 but it didn't gain regularity until 1898. It received the most usage in the year 1989 when 259 baby girls were born. The 80s and 90s weren't bad for this name. It ranked in the #700-#900 range for 9 years. Before that, it fared similarly from 1941-1967. Today Portia isn't receiving all that much love. Usage has tapered off since around 1995. In 2013, there were only 55 Portias born for a ranking of #3019. However, this isn't necessarily bad news. This means that the name is in the sweet spot between familiar and unusual. People have heard of it but it isn't popular so your daughter would most likely be the only Portia around. Many parents like to find rare gems like this. The most well-known namesake today is actress Portia de Rossi, the wife of Ellen DeGeneres. She was actually born as Amanda Lee Rogers but is now legally named Portia Lee James DeGeneres despite maintaining her stage name. There is also a fictional character in The Hunger Games trilogy known as Portia. Remember, the name Portia is not the same as the car Porsche even if they sound the same: POR-shuh. They are not related. That could be part of the reason that Portia isn't more popular since parents may not want their daughter to be associated with the posh brand. However, there are plenty of children with names of other cars like Bentley and Lexus so that may not be a valid assumption. That was a bit tricky! What would you pair with Portia? 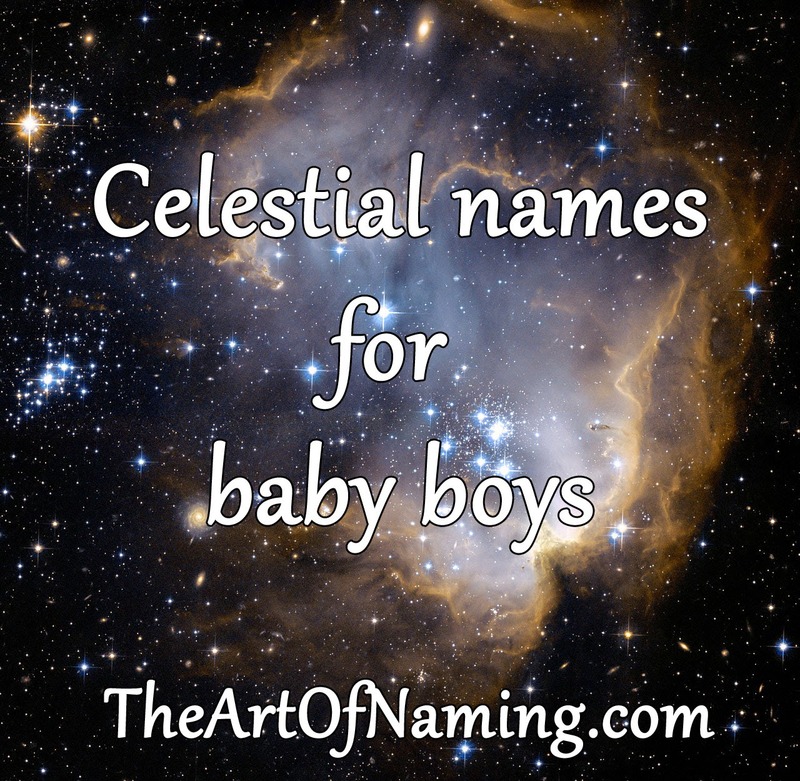 Last week we saw a great selection of celestial names for baby boys. Now it is the girls' turn! If you're looking for the perfect name for the little star in your life, perhaps you'll find it on this list! Included in the list are names of stars, constellations, planets, moons, satellites and more! It covers all things space-related. So if you're a fan of astronomy or astrology or you simply find yourself gazing up into the cosmos often, I think you'll love this list! If you're unfamiliar with any of these names, I suggest doing some research before committing to it, as with any baby name. Which of these lovely choices do you like best? What would you pair with it? I was recently asked to do an interview on another name blog, Waltzing More Than Matilda, and it was just published today! Here's a couple of the questions that I answered, but you'll have to visit their site to view the whole interview! This is a chance to get to know a little more about me! What inspired you to begin a name blog? Once I discovered that I was somewhat good at forming first and middle name combinations, (or I at least really liked doing so), I began frequenting forums to help parents find the perfect name. Then I decided to focus all of that into one place and help people on my own turf. It’s been over a year since I started the blog and I’ve helped many people, which is why I started it to begin with. What are some of your favourite names? Some of my favourites that I won’t be using include girly names like Magnolia, Freya, Coraline, Esme, Lavinia, Aveline, and Amara. For boys, I like August/Augustus, Benedict, Caspian, Constantine, Dante, Jack,Rafferty, and Silas. I can’t help but love unexpected middle names like Essence, Wintress, Frost, or Marvel. What are your favourite names that have never charted in the US? Be sure to read the rest of the interview here! As we look at celestial names this week, there's no better name to look at than Atlas. Atlas was the titan of astronomy and navigation in Greek mythology. After the Titans were defeated in war with the Olympians, Zeus condemned him to the western edge of Gaia, or the Earth, where he was then forced to hold the celestial spheres on his shoulders. 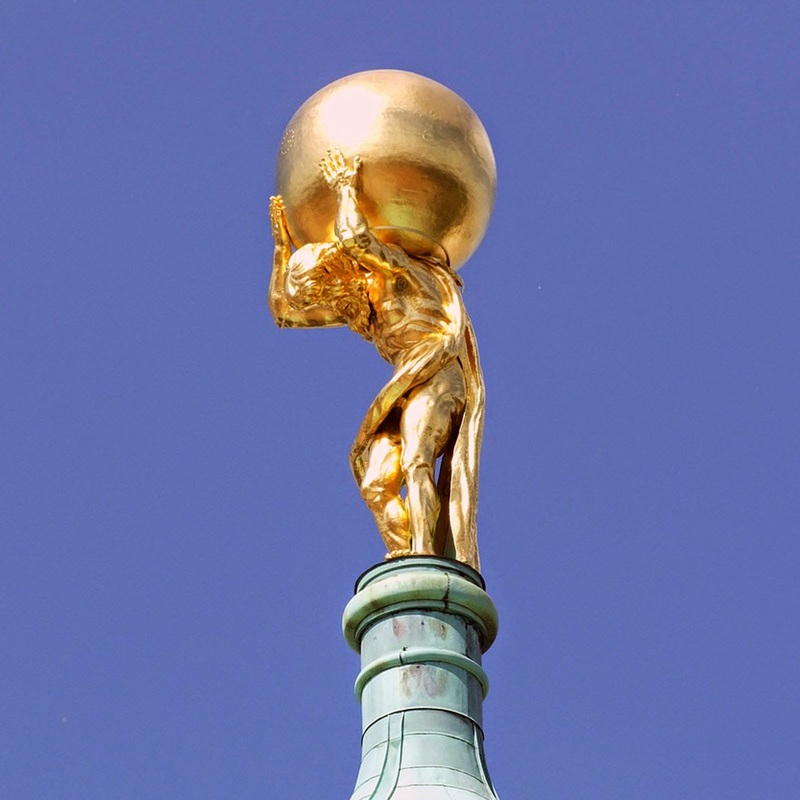 There are many depictions of Atlas "carrying the weight of the world on his shoulders". There's plenty of history that can be learned about Atlas, but we're here to talk about the name itself. You can read more about the mythological figure here. As a name, some of the etymology is uncertain, however, the ancient Roman poet named Virgil was the one who defined Atlas. He regularly translated etymologies of Greek names and combined them with appropriate adjectives. In the case of Atlas, he was given the adjective durus which means "hard, enduring". Therefore, the name Atlas has come to mean "to endure", however Behind the Name says that it has a Greek negative prefix α combined with τλαω (tlao) "to endure" that suggests a meaning of "not enduring". It makes more sense to me that it would mean "to endure" though, since Atlas must endure the weight of the sky. Other sources say that it means "to uphold, support" or simply say that it means "a titan". Take from all of that what you will. This name has been considered too powerful of a name in the past, but I've seen it floating around the baby naming community quite a lot recently. It seems to have become a viable option along with many other strong Greek and Roman names. It even has a little bit of star-power behind it from Hollywood. Anne Heche and James Tupper named their son Atlas Heche Tupper in 2009. Atlas has had quite a boost of popularity in the past few years! It was first used in 1883 but it wasn't until 1913 that it gained a bit of regularity, albeit very sporadic and in small numbers per year. Once the mid 2000s came around, births per year increased. 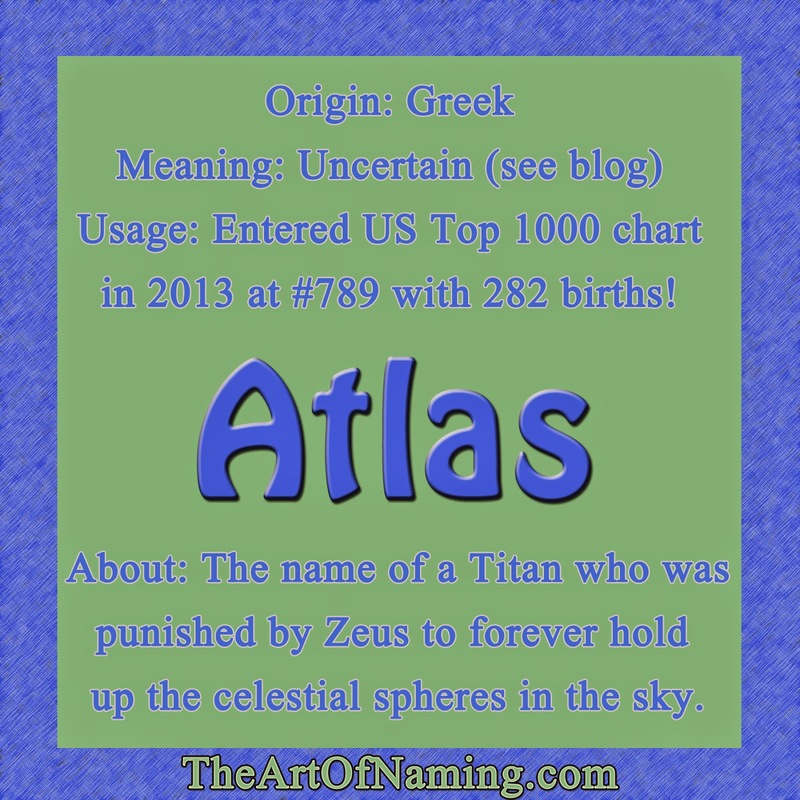 2010 saw 100 births, and by 2013, Atlas took a big leap onto the US Top 1000 chart, debuting at #789 with 282 births. It has been one of the fastest-rising names of 2013 and I'm sure it is still on its way up this year. So what would you pair with Atlas? Leave your thoughts in the comment section below or on Facebook! From stars, moons and planets to comets, satellites and even the names of iconic scientists, here is a wonderful list of all things celestial. 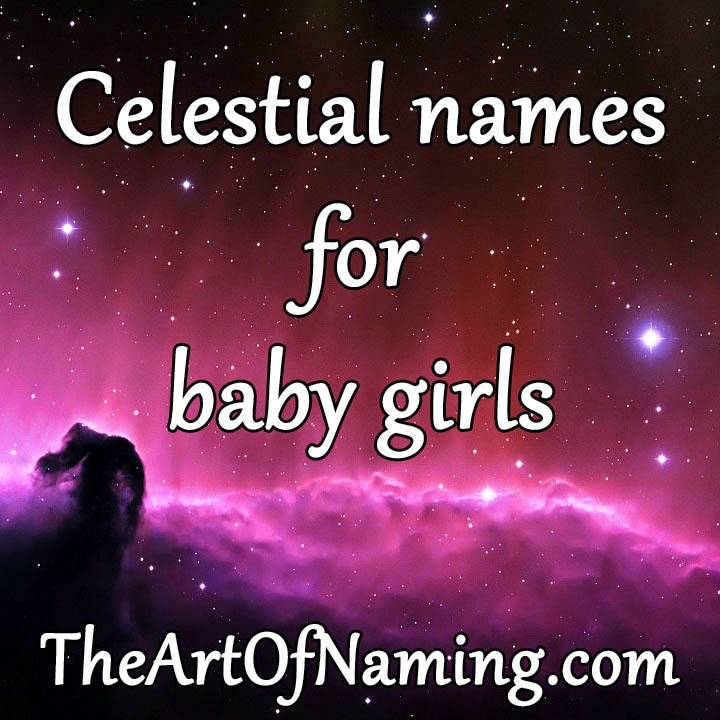 If you're into astronomy or astrology or you're simply a fan of the night sky, you're sure to find inspiration from this dazzling list of baby names. However, I don't have the space to define each of these. If you're unfamiliar with one of the names, be sure to research it before writing it on a birth certificate. :) Which of these names do you like best for a boy?